On snowy days like today, I just can’t bring myself to make my usual breakfast smoothie. That’s when cozying up to a piping hot bowl of oatmeal is what I crave. 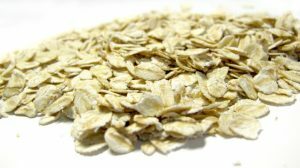 I know oatmeal is a “stick to your ribs” kind of breakfast, but I tend to think of oatmeal also as cleaning out my blood vessels and digestive tract. That’s because oatmeal is a great source of fiber, which keeps you full and regular, and it also keeps your heart healthy by lowering cholesterol. The type of fiber in oatmeal, beta glucan (or β-glucan), acts like a magnet to attract cholesterol in the blood and flush it out of the body. 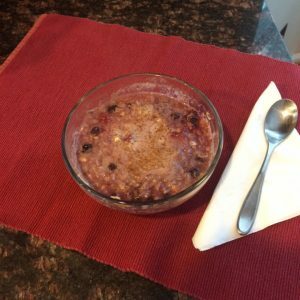 While I missed National Oatmeal Month in January, the fact that February is Heart Month gives me another reason to talk about this favorite breakfast. 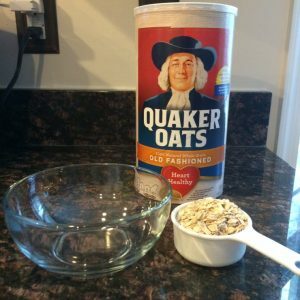 Plus, the way I make oatmeal is loaded with heart-healthy goodness. Add 2/3 cup milk (I use fat-free) and 1/3 cup water. This ratio is important! I’ve found too much milk has a less delicious outcome, and too much water makes the oatmeal bland. Besides, I like the protein and nutrients from the milk, which is why it’s a must-have (and a reason why I *don’t* get oatmeal in restaurants. 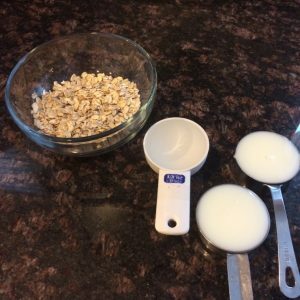 Most cook the oatmeal in water and then serve milk as an add-on, which makes the oatmeal too runny). Microwave on high for 2 ½ minutes (actual times may vary. You want it hot, but don’t let it explode). 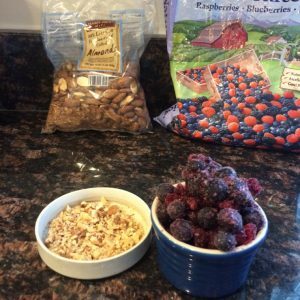 Add frozen, unsweetened fruit and coarsely chopped nuts (I like slightly-salty almonds). Frozen fruit is a must, since fresh this time of year is hard to find. It also brings down the temperature of the oatmeal and helps it congeal a bit. In the summertime when fresh berries are abundant I use those (about 1/2 cup) and add them to the very end. Coarsely-chopped nuts (1/2 ounce) lend some heart-healthy fats, which also keeps me satisfied longer. I like having them coarsely chopped to make the oatmeal a bit more chewy. You may also choose to add some sweetness here (I like 1 teaspoon of brown sugar, but regular sugar, maple syrup or honey would also work) and a hefty sprinkle of ground cinnamon. Microwave on high for 2 minutes more. Stir and let sit at least 1 minute before enjoying. The longer it sits the thicker it becomes.